The presentation of 45 title deeds on 26 September at the Montoedi Hall in Mokwallo, Vredefort by the Khaya Lam (My Home) Land Reform Project was quite a unique occasion. This is the first time that the Freemasons have been involved. 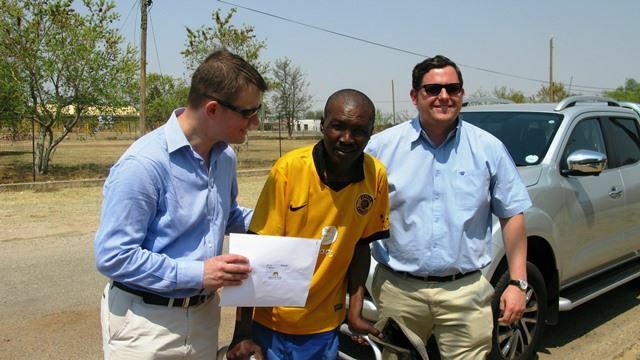 Dr Bart Kurek of Johannesburg, who is an avid supporter of Khaya Lam, and is a Mason, was the driving force behind the 34 title deeds that were sponsored by him and the Freemasons. As always there is a story: Bart is married to Sheila who comes from the Philippines. Bart met her there. Her family was dispossessed of their property during one of the regimes and received no compensation. They were left on the street. Sheila has a special “bond” with Khaya Lam and encourages patients in their practice to contribute to the project. They, plus one of their therapists and three Masons attended the ceremony. The other sponsor of 10 titles was Philip Wilson who lives in the UK. We have never met him. Every 6 months or so an amount equivalent to the cost of 10 title deeds appears in the Khaya Lam account. There are people who care about the future of South Africa! Another first was that Mrs Makoatse – the caterer who supplied the tea and cookies – had started baking at 3 in the morning that same day to have fresh cookies for the function! Mr Mahase of Erf 115 was late for the event. We were warned of his arrival as we were leaving. He was late because he had walked from his home with a walker! The presentation was done in the road to accommodate him. The ceremony was presided over most graciously by Councillor Malefu Mofokeng who officiated in the place of Mayor Mochela who was unavailable at that time. Khaya Lam thanks all the councillors and officials who contribute their time to making these presentations such special occasions for both sponsors and beneficiaries. Khaya Lam has completed 1,850 title deeds in Ngwathe with funds already pledged for another 1,250. Our ambition is to make Ngwathe the first municipal district in South Africa where every eligible person has a title deed to the home in which they live!